Following a trail of productive but understated years, the aerospace industry is now gearing up to revamp itself by espousing digital innovations. Aerospace companies have moved beyond prototyping and are leveraging additive manufacturing technology to design and build products ranging from sophisticated engine and wing parts to simpler yet customized items like food trays and armrests. Powering this upswing is machine learning through the injection of advanced analytics into the operating system of aircraft machinery. Drawing on M2M and M2H interfaces, sensors fastened to avionics can extract data instilled into analytics platforms to gain insights for making effective decisions. Meanwhile, the ushering of co-bots is spawning the perfect storm for aerospace as it enhances workers’ productivity by minimizing the amount of rework while also rendering faster throughput and higher quality. As a result, smart automation makes its way into the industry further enhanced by technologies like augmented reality—the use of smart glass for examining an airplane’s metal surface. On the digital front, blockchain stands a high chance of transforming the face of aerospace through improved transparency and automated transactions between supply chain partners globally. The market today abounds in a bevy of aerospace solution providers equipped with state-of-the-art technologies that can help companies gain proactive ideas to tackle looming challenges. Companies aiming to mount higher in the value chain look for the best solution providers. CIOReview’s distinguished panel comprising CEOs, CIOs, VCs, industry analysts along with its editorial board has reviewed the top aerospace solution providers and shortlisted the ones that are at the vanguard fulfilling the urgent demands of the industry. 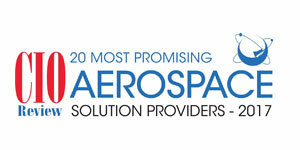 We present to you CIOReview’s 20 Most Promising Aerospace Solution Providers 2017. Dassault Systèmes Delivers 3DEXPERIENCE solution tailored for aerospace and defense that enable collaboration for creating truly innovative and better products. L3 Technologies Provides products for the global ISR market, cybersecurity, aircraft upgrades and sustainment, and a broad range of electronic systems products, simulation, security, and detection.